Helping adolescents navigate the unique educational, social and behavioral obstacles related to attending high school. I also love to bake cookies. Google’s search results have seen a whirlwind of major changes in the past two years. 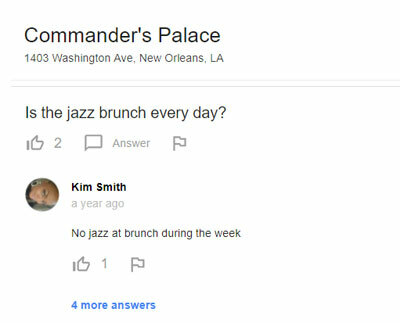 Nearly every type of modern-day search queries produce a combination of rich results beyond the standard blue links — Featured Snippets, People Also Ask boxes, Knowledge Panels, maps, images, or other enhancements. It is now even possible to browse flights, hotels, jobs, events, and other searches that were previously only available via external websites, directly on Google. As search marketers, we are keenly aware that both Google’s evolving landscape and the rise in new, rich results impact our bottom-line — more SERP enhancements and growth in “position 0” means less organic traffic for everyone else. 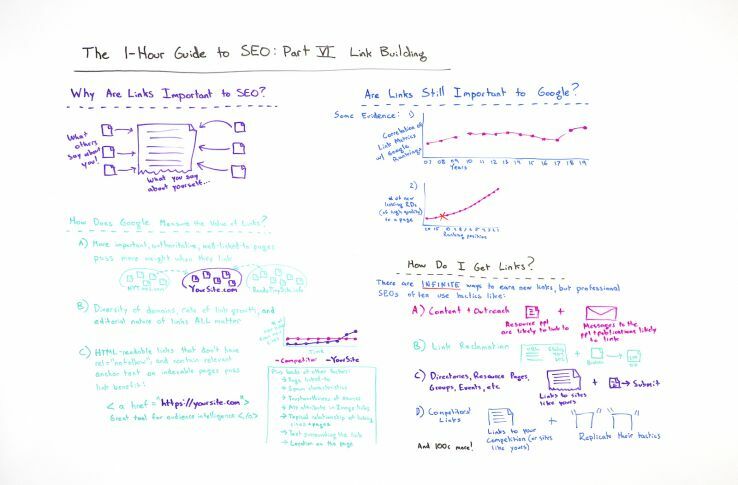 Last year, Rand Fishkin posted a remarkable Whiteboard Friday pointing out the unsettling trend that has emerged from the updates to Google’s interface: there are fewer organic links to external websites as traffic flows to Google-owned assets within the SERP. 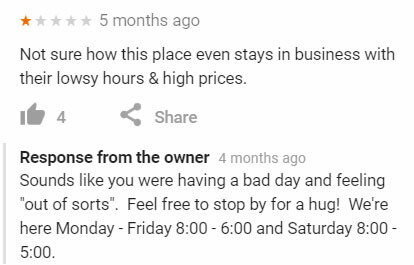 We often hear about how the digital marketing community feels about changes to Google’s interface, but it is less common to hear the opinions of the average searcher who is less technically-savvy. At Path Interactive, we conducted a survey of 1,400 respondents to better understand how they search, how they feel about Google’s search results, and the quality of information the search engine provides. 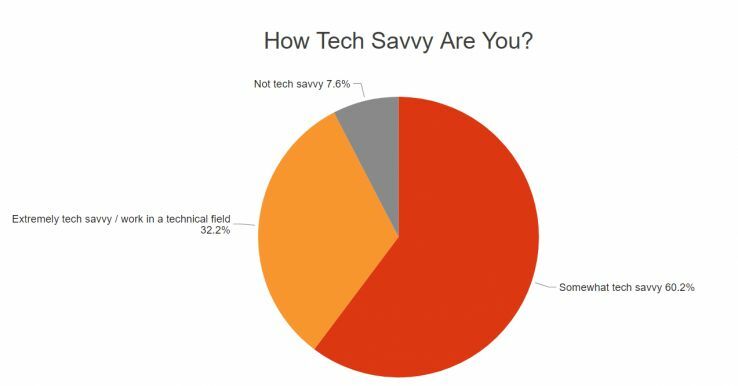 72 percent of respondents were based in the U.S., 8 percent in India, and 10 percent in Europe or the U.K. 67.8 percent considered themselves somewhat technically-savvy or not technically-savvy at all. 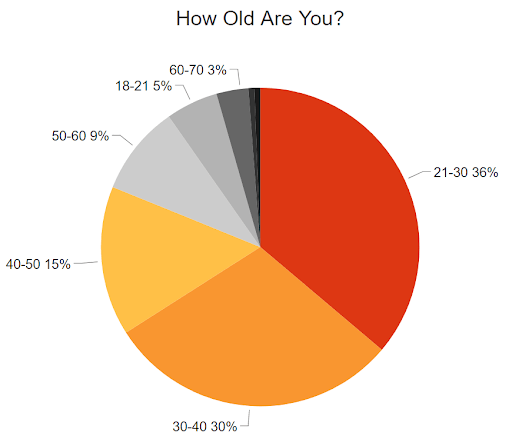 71.3 percent were under the age of 40. 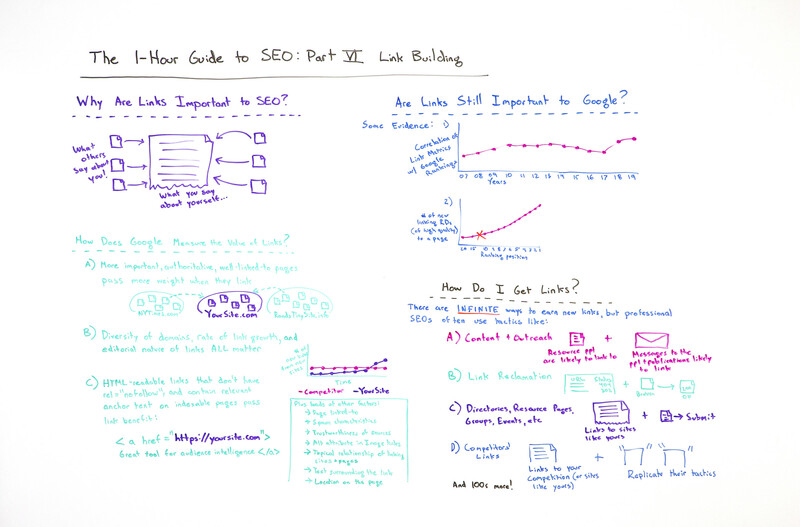 How Often Do Searchers Use Google to Find Things? 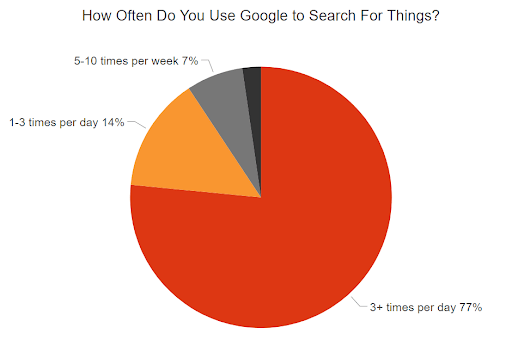 It shouldn’t be much of a surprise that the vast majority of respondents — 77 percent — use Google 3+ times a day to search for things online. The frequency of Google usage is also inversely correlated with age; 80 percent of 13–21-year-olds use Google more than three times per day, while only 60 percent of respondents over 60 searches with the same frequency. 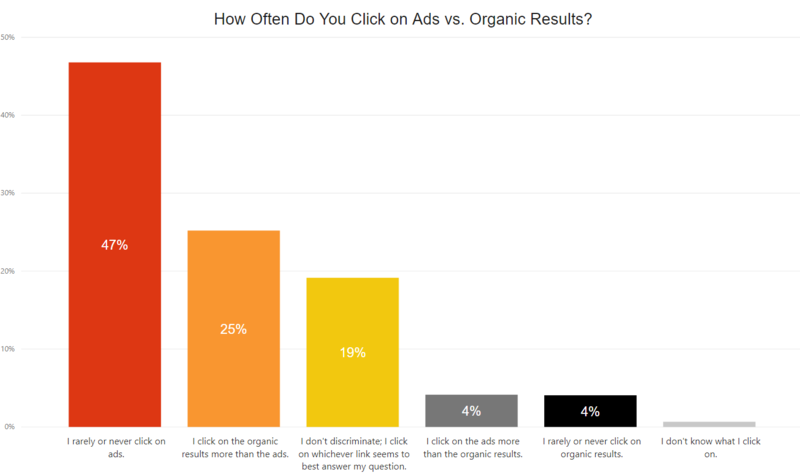 How often do searchers click ads vs. organic results? As many previous studies have shown, the vast majority of searchers prefer clicking on organic results to clicking on advertisements. 72 percent of respondents stated that they either click only on organic results, or on organic results the majority of the time. 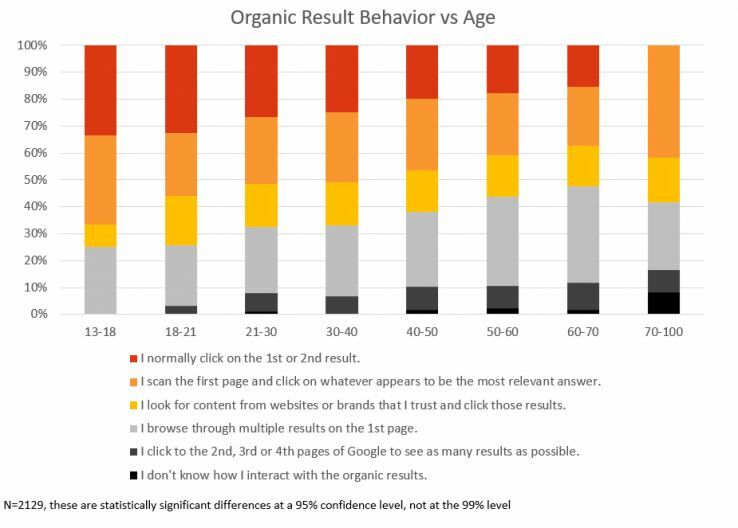 Age also plays a role in one’s decision to click on a paid or organic result: Searchers ages 60+ are 200 percent more likely than 18–21-year-olds not to discriminate between a paid and organic listing. Instead, they click on whichever result-type best answers their question. 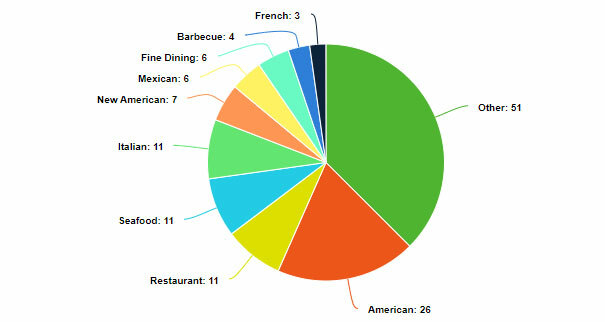 The vast majority of respondents remain on the first page of Google to find an answer to their query. 75 percent of respondents either click on the first one or two results, scan page one looking for the most relevant answer to their query, or visit multiple results from page one. 17 percent of respondents stated part of their search behavior includes looking for content from websites or brands that they trust. 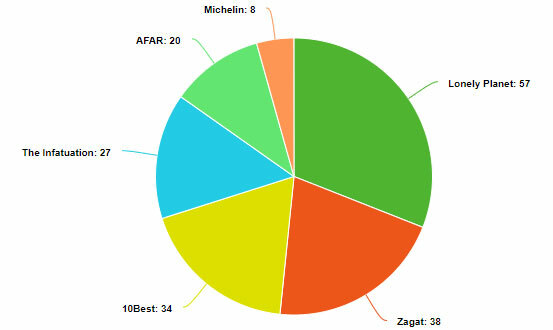 Only 7 percent of respondents indicated that they browse past the first results page to see as many results as possible. According to these results, younger users are more likely to click on the first 1–2 results on page one, while older users are more likely to explore additional results, browsing farther down on the first page — or even onto the second and third pages — to find the information they’re looking for. This trend raises some interesting questions about user behavior: are older searchers more skeptical, and therefore likely to look for a larger variety of answers to their questions? 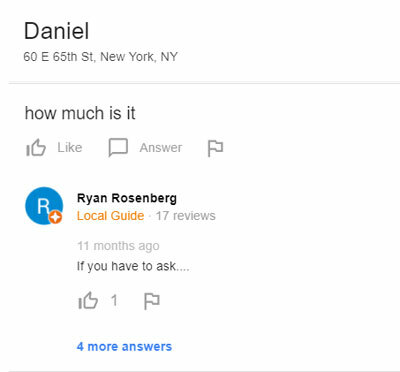 Are younger users more concerned with getting answers quickly, and more likely to settle for the first result they see? Is this tied to the rise in featured snippets? Will this search behavior become the “new normal” as teens grow older, or do younger searchers change their habits over time? If it is the future, will this trend make it even more difficult for organic results that don’t rank in the top three positions to sustain traffic over time? How do users feel about featured snippets and the Knowledge Panel? 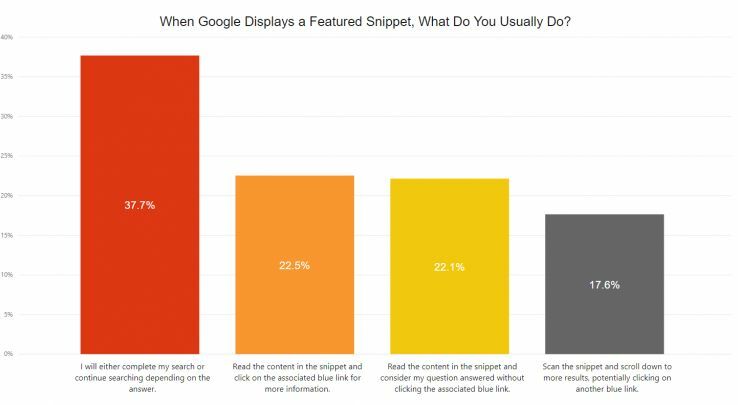 When it comes to how users feel about featured snippets, the majority of searchers say that their behavior depends on what is displayed in the snippet. Marketers who are concerned that snippets steal traffic away from organic results might be pleased to learn that a relatively low number of respondents — only 22.1 percent — indicate that they generally read the snippet and consider their question answered without clicking the blue link. 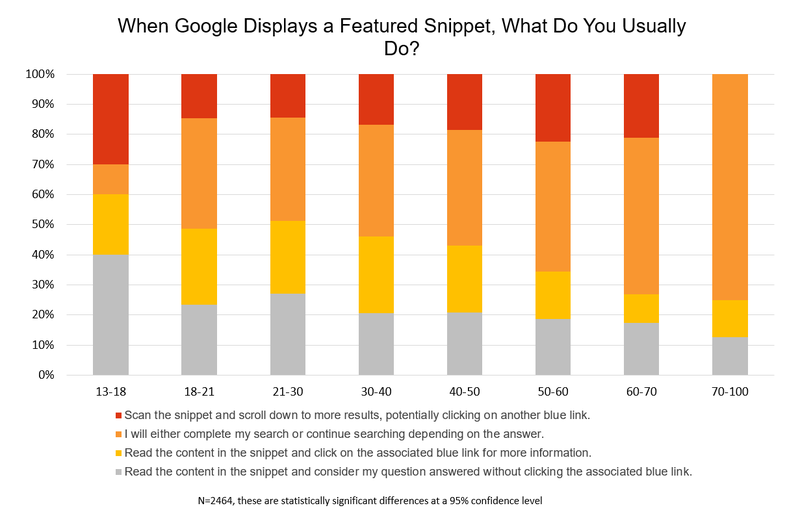 However, this data suggests another potentially alarming trend as it relates to featured snippet interactions and age: the youngest searchers (13–18) are 220 percent more likely than the oldest searchers (70–100) to consider their question answered without clicking on the snippet (or any) result. Conversely, the older respondents (60–100) are 170 percent more likely to continue searching, depending on the answer in the snippet. This again points to younger searchers seeming to prioritize getting a response quickly, while older users are more likely to spend time evaluating a variety of results. 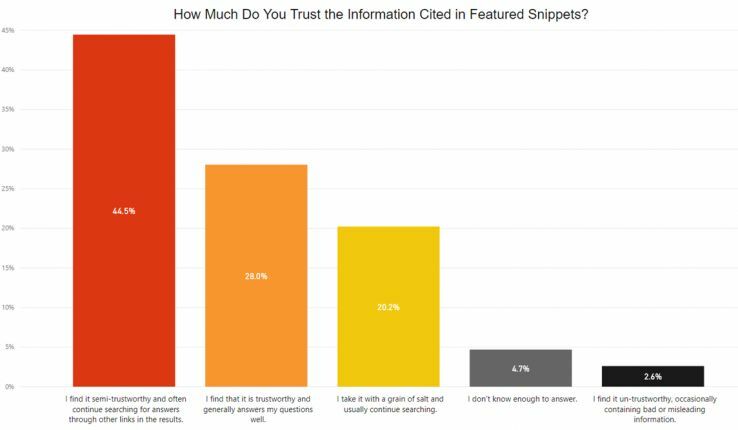 When it comes to the trustworthiness of featured snippets, most users are on the fence: 44.5 percent of users consider the information “semi-trustworthy,” and continue searching for answers to their questions. 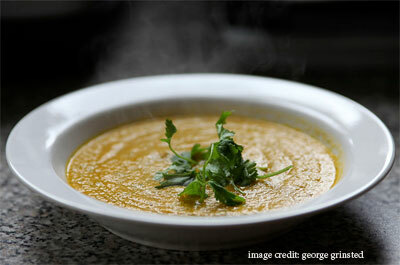 However, age once again plays a role in the results. 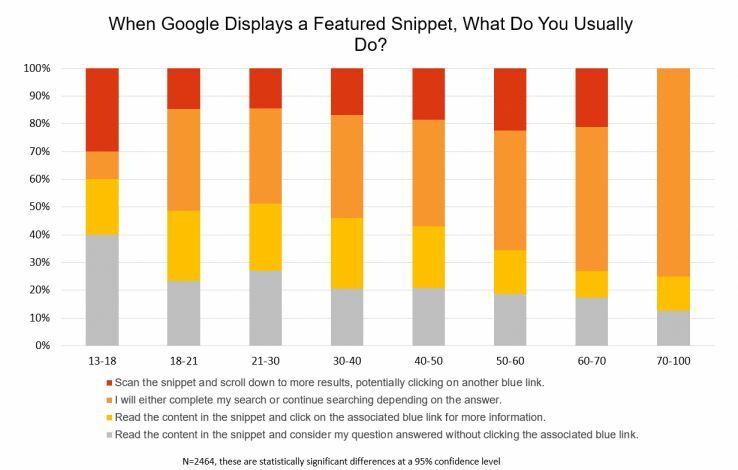 Young searchers (13–30) are 40 percent more likely than older searchers (50+) to trust the information contained in featured snippets. Additionally, the youngest category of searchers (13–18) is 53 percent more likely than average to trust featured snippets. 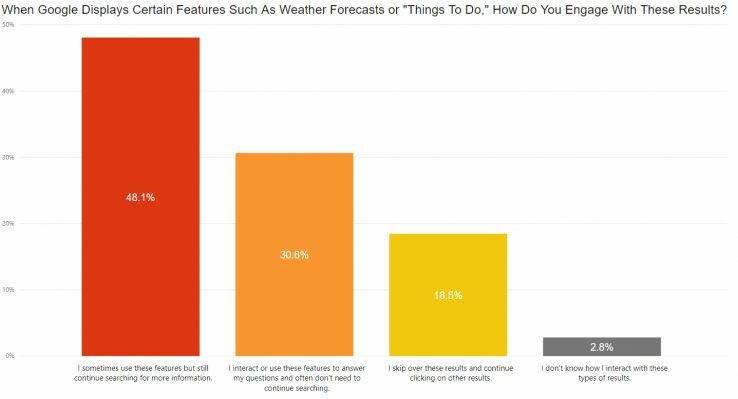 The same outcome is true for Knowledge Panel results — the majority of users (55.3 percent) scan this information but continue searching through the other results. 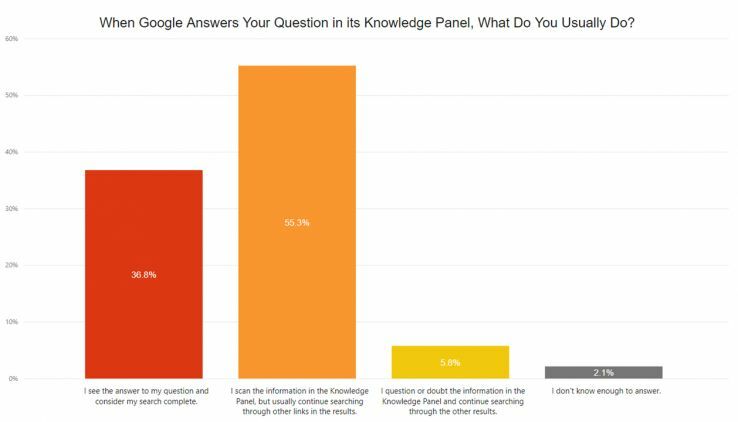 However, 36.8 percent of searchers consider the information contained in the Knowledge Panel sufficient to answer their questions, and this represents a decent amount of search traffic that previously flowed to paid and organic results before the existence of the Knowledge Panel. As with previous questions, younger users are significantly more likely to consider read the information in the Knowledge Panel and consider their search complete. Young respondents (13–21) are 102 percent more likely to consider the Knowledge Panel a complete answer to their question than older respondents (50+), who generally continue their search after seeing the Knowledge Panel. 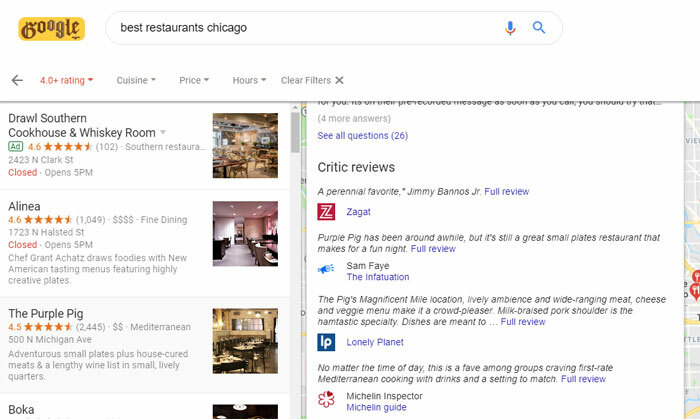 Google has rolled out many new result types that allow searchers to get the answer to their question directly within the search results. This alarms many search marketers, who worry that these results cannibalize traffic that previously flowed to organic results and have caused an increase in “no click searches.” So, how does the average searcher feel about these enhancements to the SERP? We asked searchers about two types of results: results that directly answer search queries using a proprietary Google widget (such as weather forecasts or “Things to Do”), as well as results that allow for interaction on Google, but include an organic link back to a corresponding website (such as recipes and flight results). 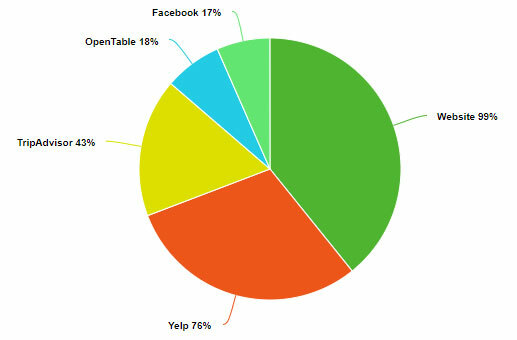 According to the data, the majority of respondents use these features but continue browsing the other search results. It is interesting to note that one-third of respondents usually ignore result types such as job listings, events, and flights, and instead skip over to the regular blue links. 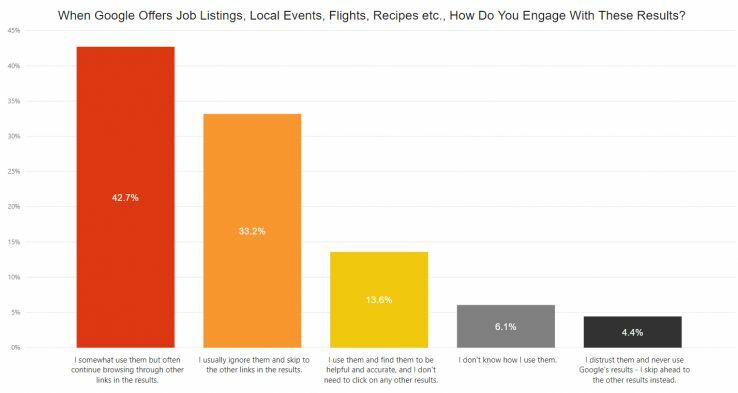 Older searchers (50+) are 63 percent more likely to ignore these results types and continue their search than younger searchers (13–30). Our next question was whether searchers have found incorrect information in any of the aforementioned result types. Given Google’s increased focus on content quality and E-A-T, we thought it would be interesting to see the general sentiment around the accuracy of these search features. A combined 58.2 percent of searchers state they have either occasionally or frequently seen incorrect information in rich results on Google. This fact is certainly on Google’s radar: just last month, Google published a whitepaper on how it combats disinformation, and the recent major updates to its algorithm reflect Google’s critical recent quest to promote accurate, trustworthy content in all of its results. How do users feel about Google? We wanted to know how users feel about Google in general, especially given all the recent changes to Google’s search results. 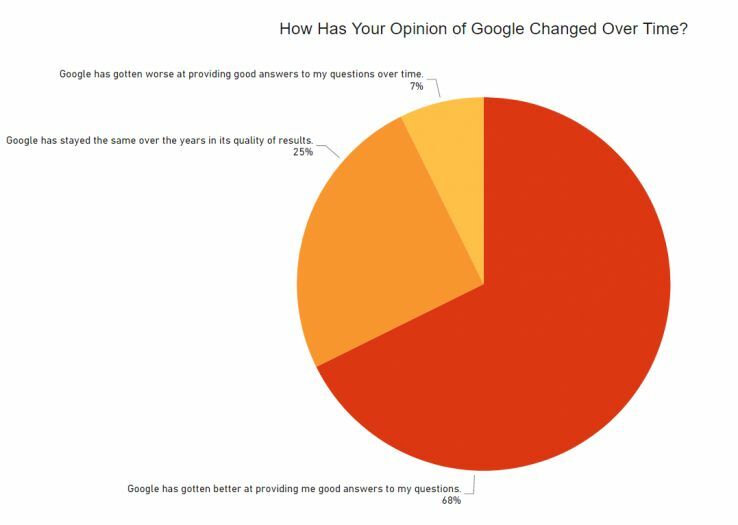 68 percent of respondents stated that they feel the quality of Google’s results have improved over time, and the majority of respondents don’t have specific complaints about Google. 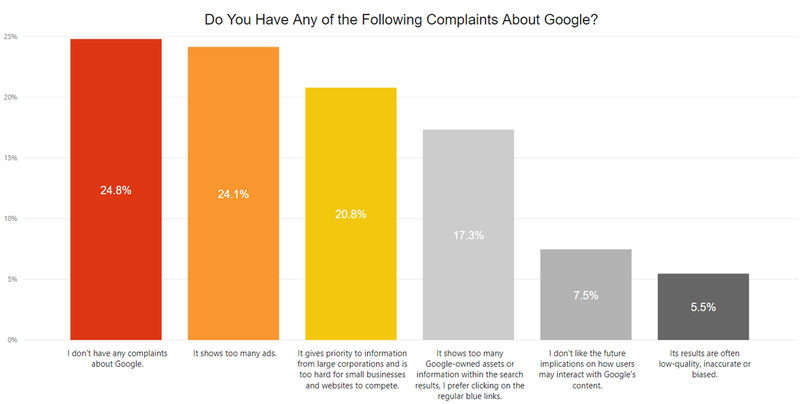 Among those respondents who do have issues with Google, the most common complaints involve Google showing too many ads, prioritizing content from large corporations, making it harder for small businesses to compete; and showing too many Google-owned assets within the results. We also opened up the survey to allow respondents to leave feedback about how they feel about Google and the quality of its results. The vast majority of responses related to user privacy, the unsettling feeling of sharing private information with the search engine, and disliking that search queries are used in retargeting campaigns. 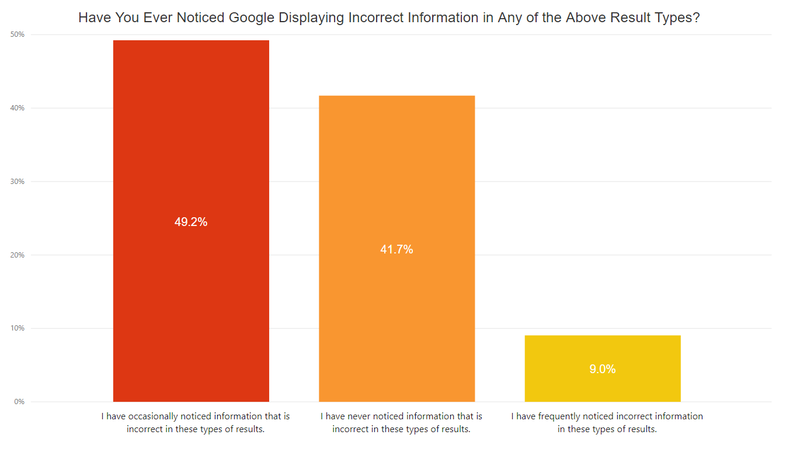 Several respondents were concerned about the political and philosophical implications of Google deciding what content should or should not be prominently featured in its results. 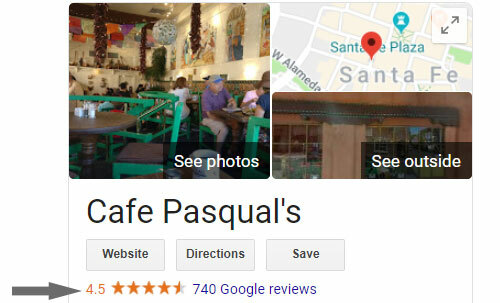 Some complaints had to do with the limited options to apply filters and perform advanced searches in both standard results, as well as on Google Images. 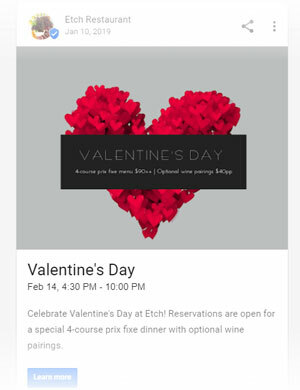 Should businesses and marketers be worried that Google’s increasingly rich results will slowly steal away our precious traffic for good, and increase the number of no-click results? 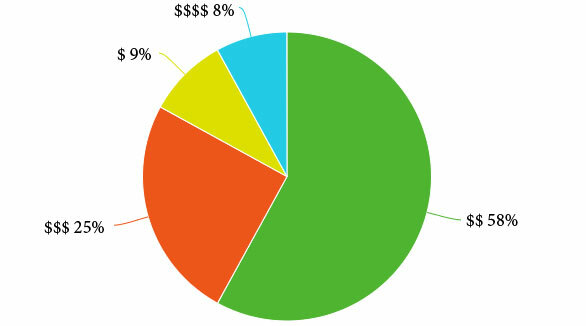 The results from our Google Usage survey indicate that, at least for now, there’s no need to panic: Searchers are still prone to gravitating toward the regular blue links, both organic and paid. They are largely skeptical about taking all of the information included in rich results at face value. However, there is data to support that younger searchers are more likely to implicitly trust the information provided in rich results, and less likely to visit deeper pages of the search results during their search journeys. This should be an interesting trend for marketers to pay attention to over time — one that raises many philosophical questions about the role that information from Google should play in our lives. With its recent push for E-A-T compliance, it’s clear that Google is already grappling with the moral responsibility of providing information that can majorly impact the happiness, safety, and well-being of its users. 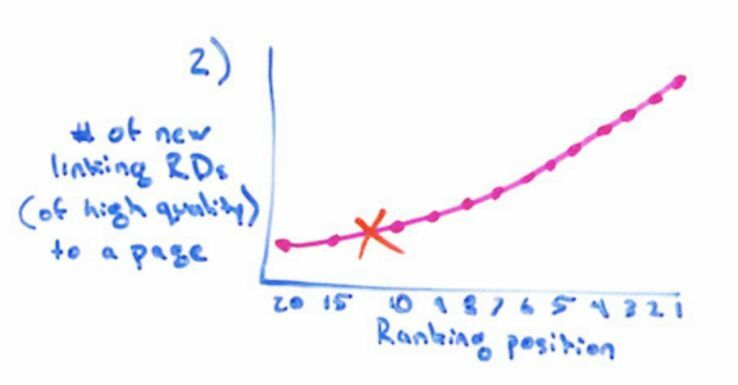 But what happens when important information doesn’t meet the ranking criteria laid out by Google’s algorithm? What happens when society’s understanding of certain topics and ideas changes over time? Does Google’s algorithm create an echo chamber and limit the ability for users to share and discover diverse viewpoints? What happens when the information Google shares is blatantly wrong, or even worse, dangerous? While it is important that Google maintains the highest quality standards for displaying credible and trustworthy information, freedom of speech and diversity of ideas must also remain of utmost importance, as future generations become increasingly trusting of the information they discover in the search results. And now, you tell us: how do you feel about Google’s changing landscape? 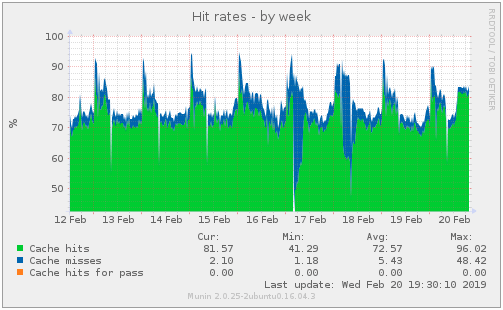 So a href=”https://yoursite.com&#8221; great tool for audience intelligence, that would be the ideal link for my new startup, for example, which is SparkToro, because we do audience intelligence and someone saying we’re a tool is perfect. This is a link that Google can read, and it provides this information about what we do.